The SR715 LCR and SR720 LCR Meters measure passive components with as little as 0.05 % error. These easy-to-use instruments are quick to setup, adjust and calibrate. The SR715 and SR720 are ideal for applications such as incoming inspection, quality control, automated test, and general benchtop use. 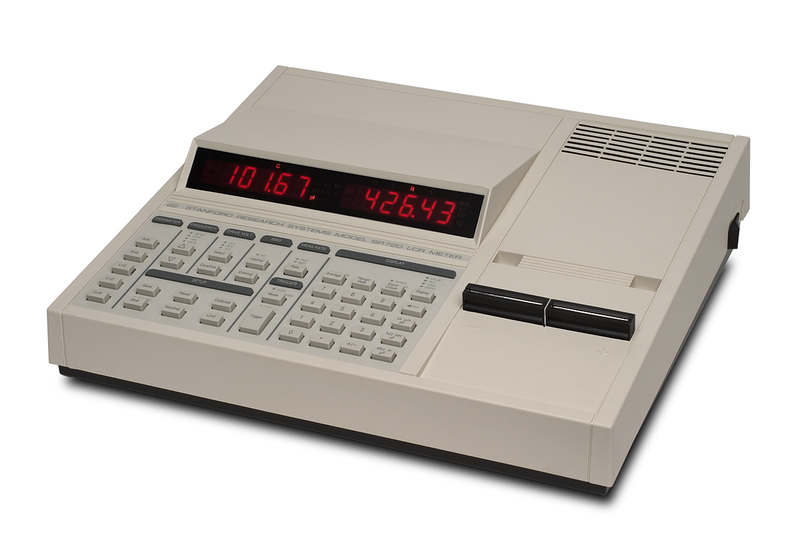 A 5-digit LED display shows measured values, entered parameters, instrument status, and user messages. When making measurements, the major parameter (L, C or R) is shown on the left display and the appropriate minor parameter (Q, D or R) is shown on the right display. Measurements can be performed at test frequencies of 100 Hz, 120 Hz, 1 kHz, 10 kHz and 100 kHz (SR720 only). A built-in drive voltage can be set to preset values (0.1, 0.25 and 1.0 V) or adjusted from 0.1 to 1.0 V in 50 mV increments. Measurements are taken at rates of 2, 10 or 20 samples per second. Consecutive readings can be averaged between 2 and 10 times for increased accuracy. Both series or parallel equivalent circuit models of a component are supported. Capacitor measurements use either the internal 2.0 VDC bias or an external DC source of up to 40 volts. The power and flexibility of the SR715/720 does not come at the expense of ease-of-use. A convenient AUTO measurement mode automates the selection of setup parameters and quickly determines the appropriate device model for whatever component is being measured. Up to nine instrument setups can be stored in non-volatile memory for quick recall at a later time. The SR715 and SR720 make it simple to compensate for lead impedance and stray fixture and cable capacitance. The null calibration procedure automatically corrects both open and short circuit parameters at all frequencies and all ranges. The SR715 and SR720 have built-in features to aid in component sorting. This is especially useful for production testing, incoming inspection, device matching, or when you need to test multiple devices of similar value. The meters allow you to sort components into as many as ten different bins. The SR715 and SR720 support three types of binning schemes: pass/fail, overlapping and sequential. Pass/Fail has only two bins; good parts and everything else. Overlapping (or nested) bins have one nominal value and are sorted into progressively larger bins (e.g., ±1 %, ±2 %, ±3 %). Sequential bins can have different nominal values, each separated by a percentage or a nominal value and asymmetrical limits. Binning parameters are also easily stored in non-volatile RAM for quick setup in production environments. The SR715 and SR720 have a kelvin fixture which uses two wires to carry the test current and two independent wires to sense the voltage across the device under test. This prevents the voltage drop in the current carrying wires from affecting the voltage measurement. Radial components are simply inserted into the test fixture, one lead in each side. Axial devices require the use of the axial fixture adapters (provided). Surface-mount devices, or components with large or unusually shaped leads, can be measured with optional SMD Tweezers (SR727) or Kelvin Clips (SR726). 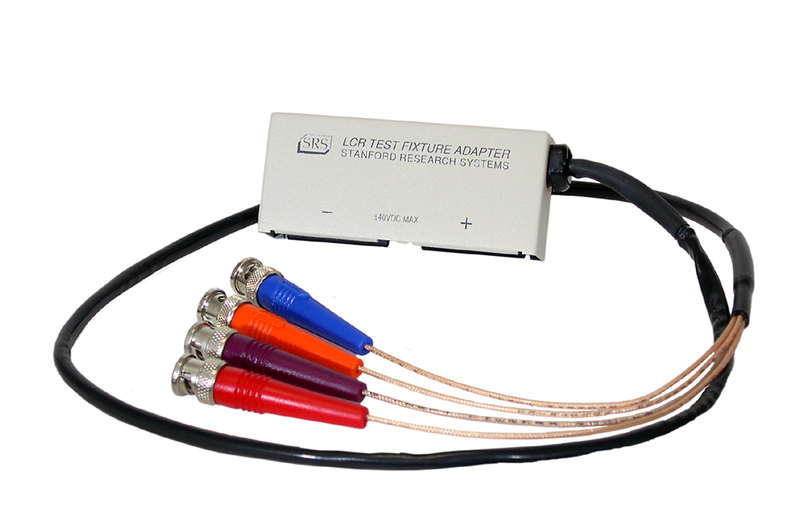 The tweezers and clips attach directly to the LCR meters front-panel test fixture. An optional BNC Fixture Adapter (SR728) allows you to connect a remote fixture or other equipment through one meter of coaxial cable. Two rear-panel input connections are provided for an external bias voltage. Voltages as high as 40 VDC can be used. An optional handler interface provides control lines to a component handler for sorting. A standard RS-232 interface allows complete control of all instrument functions by a remote computer. A GPIB interface is included with the handler option.